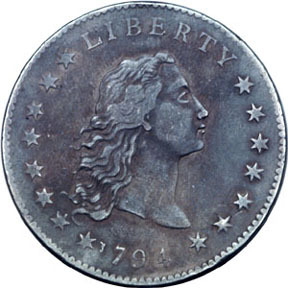 Congress had specified that the new coins should bear a design "emblematic of Liberty," and Scot accomplished this with a right-facing portrait of a youthful female figure whose hair flowed freely behind her hence the descriptive term "Flowing Hair." The word LIBERTY appears above her, with the date below and 15 stars along the sides, symbolizing the number of states in the Union at that time. Scot is said to have meant the flowing hair to signify freedom. 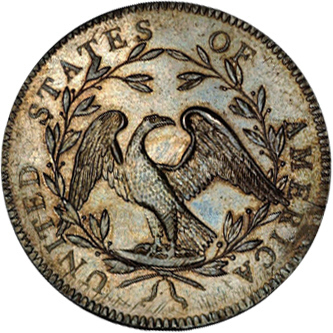 A pattern 25-cent piece of 1792 served as Scot's model for the obverse; this had been designed by Joseph Wright, who died of yellow fever in 1793 after serving briefly as Mint engraver. The dollar's reverse depicts a small, spread-winged eagle perched upon a rock and surrounded by laurel branches. Encircling this, along the border, is the motto UNITED STATES OF AMERICA. The dollar's "third side," the edge, carries the inscription HUNDRED CENTS ONE DOLLAR OR UNIT, with decorations separating the words. Almost 170 years later, in 1964, a small box of "strange" coins was consigned to a Christies auction in London by the family of British nobleman Major Sir Roland Denys Guy Winn, M.C., Fourth Baron St. Oswald. The box contained about $10 in face value of new U.S. coins, dated either 1794 or 1795. Most notable of these pieces were two uncirculated 1794 dollars which brought $11,400 each at the sale. When the coins returned to the United States, the excitement generated among American collectors began to take on a life of its own. A story took root that had one of Lord St. Oswald's ancestors traveling to Philadelphia in 1795 and receiving the coins directly from Henry DeSaussure, Rittenhouse's successor as Mint Director. While this account makes fascinating reading and has been accepted as fact for over thirty years, recent research has uncovered that it's based entirely on conjecture. No family records or accounts support the proposition of a trip to the United States by a St. Oswald ancestor; in fact, they tend to refute it. We don't know for certain how the coins were obtained or by whom only that they were in the St. Oswald family's possession in 1964. Perhaps a future numismatic researcher will be able to unravel this mystery. Further dollar production was suspended until a new press capable of imparting fuller, stronger strikes could be installed. It didn't resume until early May of 1795, and from then through mid-October the new equipment cranked out more than 160,000 Flowing Hair dollars dated 1795. In October, the design gave way to a new Draped Bust dollar, making the Flowing Hair dollar a two-year type coin. 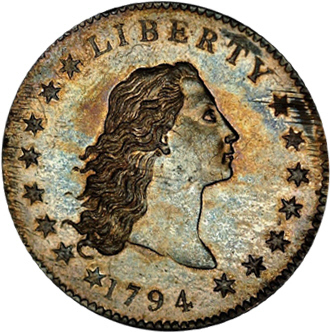 Despite its brevity, the Flowing Hair dollar series is widely collected by type (most collectors selecting the 1795 issue, because it is so much more plentiful than 1794). 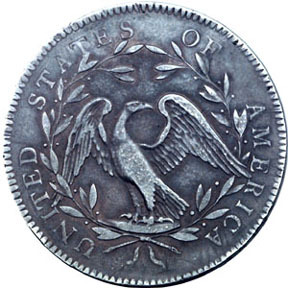 Some of the 1795 dollars have two leaves below each wing of the eagle, while others have three. Both kinds are equally available, however. There are no records of proofs for either year, but some 1795 dollars are purported to be "specimen" strikes. Mint state pieces of both dates are very rare. Points to first show wear are the cheek, shoulder and hair above Liberty's forehead and the eagle's breast, head and wing-tops.